CEA said that among the positive lessons of last year was a significant one that related to public attitude and perception. 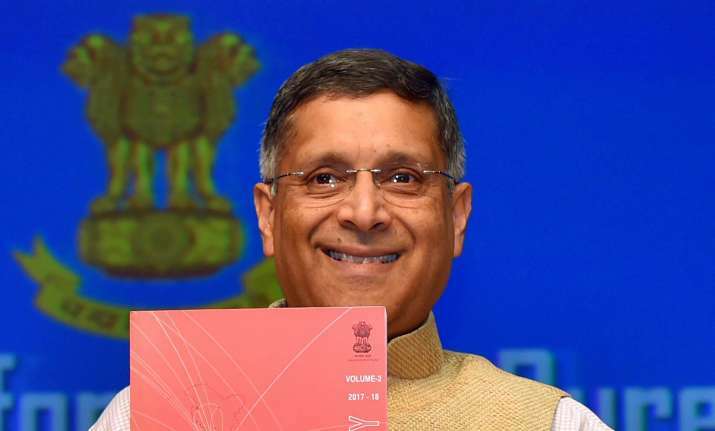 Making a philosophical summation of Economic Survey 2017-18 authored by him, Chief Economic Advisor (CEA) Arvind Subramanian on Monday that among the positive lessons from the year past was from the efforts begun to shift India away from a prevailing mindset he described as "stigmatised capitalism", which, in turn, had earlier replaced one of "crony socialism." Subramanian, who has authored the Survey, was addressing reporters here following the tabling of the government's annual report on the economy in Parliament earlier in the day, which precedes the presentation of the Budget on February 1. Concluding his media address, the CEA said that among the positive lessons of last year was a significant one that related to public attitude and perception. "Speaking of the positive lessons of last year, the last 50-60 years have seen a shift in attitude from what I call..and I claim the patent for these definitions..from crony socialism to stigmatised capitalism," he said. "It is this stigmatised capitalism that has made reform of the Twin Balance Sheet (TBS) problem very difficult," Subramanian said referring to the phenomena of a heavily leveraged corporate India, as well as the related problem of massive accumulated non-performing assets (NPAs), or bad loans, of state-run banks. "If we can address the TBS issue, it will go a long way to tackle the exit problem (insolvency in corporate India) and the 'Maahaul' (ambience or environment) of stigma towards capital," he added. The latest Economic Survey said: "The ambivalence relating to the private sector relates to the experience with Indian capital. The private sector has always had to struggle with the stigma that came with being midwifed in the era of the license-quota-control Raj." The roots of the NPAs in the Indian banking system, which have reached the staggering level of nearly Rs 9 lakh crore go back to the boom period in the economy during the previous decade under United Progressive Alliance (UPA) rule. Only the bad loans of state-run banks add up to around Rs 7.5 lakh crore. The government has embarked on a two-pronged strategy on bad loans. On the one hand, it has brought in the Insolvency and Bankruptcy Code (IBC) which provides for a six-month time-bound insolvency resolution process. On the other hand, it has approved a Rs 2.11 lakh crore recapitalisation plan for state-run banks. The Reserve Bank of India has referred 12 accounts, totalling about 25 per cent of the gross NPAs, for resolution under the new IBC. "As a result of the TBS problem, the public concluded that promoters had little skin in the game, that India had 'capitalism without equity', and that instead of limited liability there was very little liability, all further exacerbated the negative perception of Indian capital," the Survey said.